13. Habenaria C. L. Willd., Sp. Pl. ed. 4, 4:44. 1805. Hook.f., Fl. Brit. Ind. 6:131.1890; J. Renz in Rech.f., Fl. Iran. 126:60.1978. Terrestrial plants with entire globose or oblong tuberoids. Stem slender or stout with several to many cauline or 1-2 basal leaves. Inflorescence one to many-flowered. Flowers very variable in size and form, resupinate, mainly green or white, rarely yellow or rose. Perianth segments free; dorsal sepal and petals usually forming a hood over the column; lateral sepals spreading or reflexed. Petals entire or parted in two, sometimes the anterior segment fimbriate or laciniate or only tooth-like. Labellum with basal nectariferous spur, entire, 3-lobed or 3-5-partite, side-lobes occasionally fimbriate or pectinate. Column very variable in structure; anther erect; pollinia 2, sectile; anther-cells with distinct, ± long anther-canals, enclosing the caudicles, each attached to a naked viscid gland; staminodes granular, usually rather small; rostellum trilobed, mid-lobe ± prominent between the anther-cells; stigmata 2, on separate, distinct processes. A large cosmopolitan and very polymorphous genus, distributed in temperate and mainly in tropical regions with c.800 species. 8 species are represented in Pakistan. Habenaria aitchisonii Reichb.f. apud Aitch. Bonatea punduana Lindl. ex Wall. = Habenaria digitata Lindl. Habenaria brachyphylla Aitch. = Habenaria aitchisonii Reichb.f. apud Aitch. Habenaria graveolens Duthie. = Habenaria digitata Lindl. Platanthera latilabris Lindl. 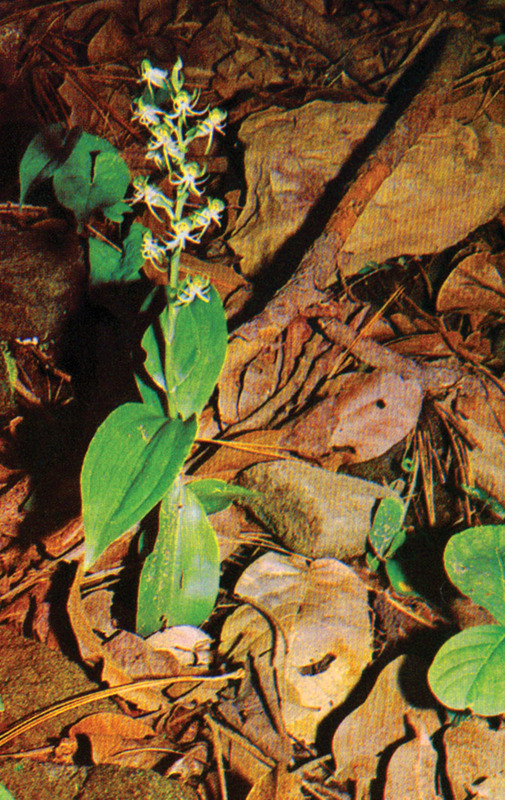 = Habenaria latilabris (Lindl.) Hook.f.